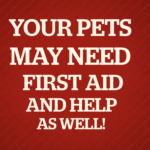 Pet first aid promotion video - did you know what our pet centres offer? Pet first aid promotion video – did you know what our pet centres offer? Here is a short video telling you what our Pet First Aid centres offer. If you would like more details on our pet first aid training from a video online course to nationwide classroom courses or our instructor training program, call us on 01206 805359 or email support@protrainings.uk.